Amino acids are the building blocks of muscle. However, your body can’t produce branched chain amino acids (BCAAs) on its own, so you have to acquire them through your diet. BCAAs are a great supplement to take during a workout or during the day to compliment your fitness routine, helping to reduce muscle breakdown so you can recover more effectively after an intense workout. 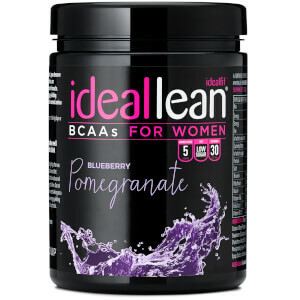 IdealLean BCAA formula is specifically designed to support the female body. Each serving of IdealLean BCAAs offers 5 g essential amino acids to reduce muscle soreness & aid recovery after a workout– with a low sugar and calorie content! We’ve also added L Glutamine, CLA & Green Tea Extract to help improve performance with a Vitamin B blend for additional energy & beauty benefits! Our BCAAs are enriched with coconut water which is a great natural electrolyte and excellent source of hydration following a workout, with a high amount of potassium, to support intense cardio sessions. 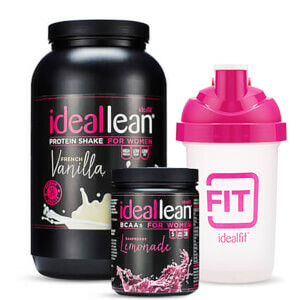 IdealLean BCAAs are also supplemented with L-Arginine & L Glutamine which is used for aiding muscle recovery through increased protein synthesis & muscle blood flow. Mix up your BCAAs with this tasty watermelon twist! BCAAs specially designed for women. 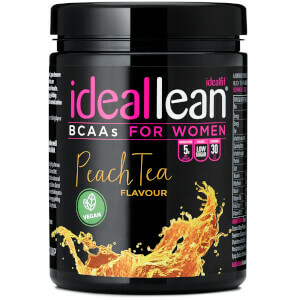 Discover our best-selling BCAAs flavour with a delicious peach addition!